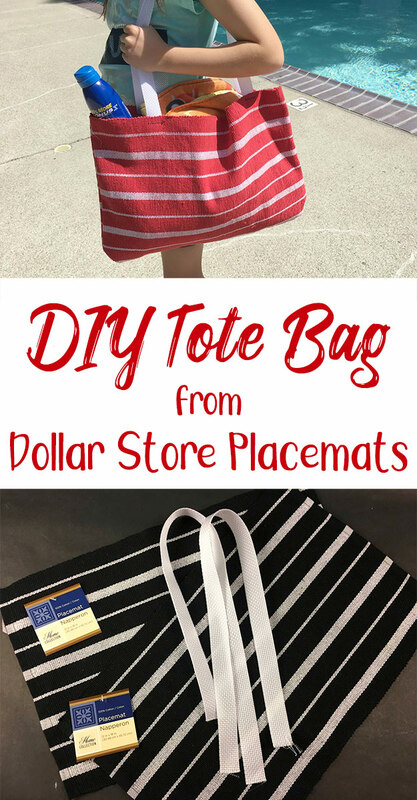 This tote is the perfect size for the pool or a trip the library, and since the placemats are so nice and thick, I know it will stand up to a lot of wear and tear! I thought it would be a great teacher gift with a few summer treats for the end of school. I wanted to demonstrate EXACTLY how easy it was. And by easy I mean it LITERALLY took me under 4 minutes to put the entire thing together, start to finish, so I made of video of the entire process. You can stitch right along with me.. it is THAT easy! You can also watch a high resolution ad-free version of this tutorial on my YouTube Channel. 2 woven dollar store cotton placemats. I found them in red, blue and black at my dollar tree. 2 (26 inch) lengths of 1-inch wide woven nylon or cotton webbing. (I got mine at the craft store in the “belting” section. Near the elastic and notions.) You can get it in a huge variety of colors, but I just chose white since I wanted it to show up in the video. The Video walks you through the entire process but basically you just sew up three sides of the placemat and add straps. That is all there is to it. Even the most novice of sewist could tackle this one. It would be a great learning project for kids too since it is all straight lines! If you make your own version of this project I’d love to see it in the comments..
Plus don’t forget to visit the other beautiful spring projects submitted for this month’s Dollar Store Design Squad challenge. VISIT THIS POST to see them all! What a great idea, this turned out adorable! I love stripes. Nice for Summer and you have a sweet model there.